2018–2019 Pre-Packaged School Supplies are On Sale Now! 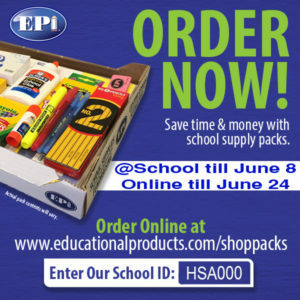 Online ordering is available at www.epipacks.com. Follow the directions to complete your order. Keep your online confirmation as your receipt. For the past 4 years, HSA Beaumont has offered this convenient service. Pre-purchasing your child’s school supplies for the coming school year is not only a time-saver for you, but also a portion of the proceeds go HSA Beaumont to support our amazing programs. One stop shopping. No hassle – No crowds. Enjoy your full summer! One less September expense! This is normally an expensive month buying new clothing, supplies, fundraising etc. Much greener – less gas and travel time. Each pack is customized to teachers of Harmony Science Academy-Beaumont and can be picked up during Orientation day. Sales tax will be added at checkout. Please print & keep your confirmation as your receipt.